The Facility Chooser is used anywhere in the application where the user needs to select a facility (or facility group). To select a different facility, click the facility name or the facility icon on the current dashboard header. The Facility Chooser will open and display available facilities or folders of facility groups. By default, the facilities and facility groups are displayed in tile view. Facility Groups are indicated with the icon to the left of the facility group name. Since facility groups, by definition, are groups of facilities, each of the facility group tiles also display a folder icon in the top-right corner. Clicking on the folder icon will display the facilities group members in the Facility Chooser. The Facility Chooser provides a variety of options to view and select facilities. Search – Search available facilities by entering a text string into the search box below the Facility Chooser header. The display of facilities will be limited to the search string. Note that the search string must be at least three (3) characters; searching one or two characters will not return results. The search function only searches on FACILITY_CODE and FACILITY_NAME. The Facility Chooser can search through all folders, but the search option does not automatically search sub-folders. Thus, facilities within facility groups will not initially be found. A notice at the bottom of the search window indicates that additional results may be available and when the user selects the Search button, a search will be performed across all folders and sub-folders for any facilities matching the search string. The search will temporarily reset the current folder structure. Clicking the icon at the end of the search box will clear the search and reset the user to the folder structure prior to the search. Favorites – Choose from a list of the user's favorite facilities. Favorite facilities are selected in tile view by clicking the star on the tile. This will change the star to gold, and that facility will show up in the Favorites view. Recent – Choose from a list of recently used facilities (sorted in reverse chronological order—most recently used first). Browse – Browse all facilities accessible to the user. 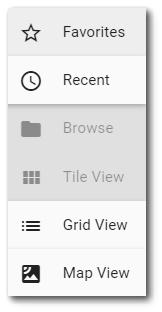 Tile View – This option will display the facilities as large tiles (default view). Grid View – This option will display the facilities in list form. In addition to the facility name, this view displays the FACILITY_CODE, FACILITY_ID, and owner of the facility. Once the desired facility or facility group is found, simply click on the tile to select the facility and close the Facility Chooser. For users with viewer permission to all facilities within a facility group, clicking the facility group tile will choose the facility group as the selected facility (e.g., to report on the entire group, etc.). There are two options to leave the Facility Chooser without selecting a new facility. Clear Facility – The icon closes the Facility Chooser and clears the dashboard facility. Close Facility Chooser – The icon closes the Facility Chooser without changing the selected facility.